When it comes to healthier chocolate chip cookies, this one’s pretty high on my list of favorites. 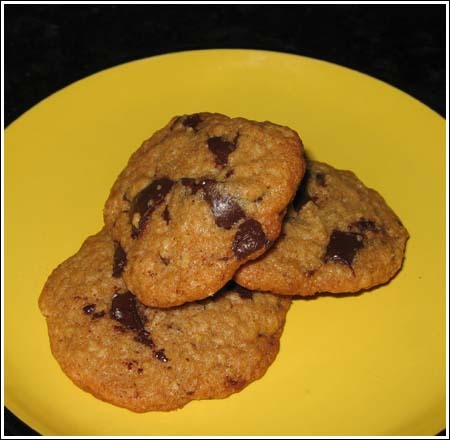 The recipe, which is from Eating Well, uses chocolate chips, oats, whole wheat flour, less than the usual amount of butter, canola oil, dark chocolate (because chocolate is health food these days, right?) and 1 egg. Here’s my version of the recipe, which calls for nuts. I usually use dark chocolate chunks instead of chips and I sometimes swap out part of the canola oil with a little bit of walnut oil. Preheat oven to 350°F. Line two baking sheets with parchment or use non-stick cookie sheets. Grind oats in a blender or food processor. Transfer to a medium bowl and stir in flour, baking soda and salt. In another large bowl, beat together butter, oil, granulated sugar, brown sugar, egg and vanilla until smooth and creamy. Add the dry ingredients and stir until just combined. Stir in chocolate and nuts. Chill dough for thicker cookies. Drop the dough by rounded teaspoonfuls, at least 1 inch apart, onto the prepared baking sheets. Bake cookies, 1 sheet at a time, until firm around the edges and golden on top, about 11 or 12 minutes. Cool the cookies for 2 minutes on the baking sheets, then transfer to wire racks to cool completely. I just wanted to say that I love these cookies! I’ve baked them several times. They are quick and easy and the batch size is perfect.